The Massey Ferguson Sports and Social Club in Coventry, close to where the iconic tractors were once produced, is a reminder of Britain’s great manufacturing heritage. But these days it also fulfils the important role of a community resource as well as providing leisure facilities for employees of AGCO, the multinational giant that purchased Massey Ferguson in 1994. This five acre ground hosts cricket and football, with non-league soccer played on its floodlit pitch and a junior academy for young players. A full size cricket square has 12 strips and a synthetic pitch for juniors. Chosen to alleviate compaction and consolidation, the Maxislit also helps to move water through the soil profile through the winter sports season, helping to dry out the surface. With a working width of 1.8m it makes light work of multiple pitches and comes with a choice of tines. “Slitting also gets air into the soil profile, keeping it in good condition, and encouraging growth when temperatures rise in the spring,” comments Bob. “Over the years I have purchased a number of pieces of equipment from SISIS for other clubs including Auto Rotorakes, Auto turfman & combination frames to name a few”. 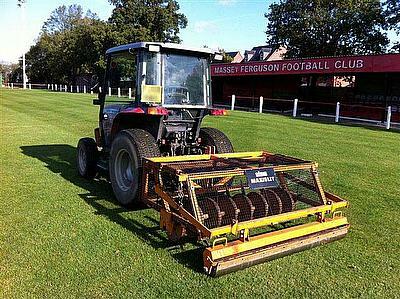 The Maxi slit’s 3 point linkage is ideal for his 40hp MF1540 compact tractor, and Bob notes that the combination is an ideal size for sports fields.